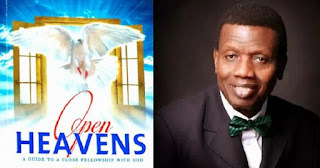 Open Heaven [28 May 2018] Grace II - Open Heavens Daily Devotional Messages, By Pastor E.A Adeboye. Grace is God’s character by which He shows Himself as being compassionate, loving, merciful, accepting and generous to all mankind. God’s grace shield sinful mankind from His wrath grants them forgiveness and bestows on them His righteousness so that they can live and grow up in faith and obedience to Him. Grace and mercy are particularly expressed through God’s covenant with His chosen people and through Jesus Christ’s atoning death on the cross. It is important to note that divine grace is a gift of God, and it is abundant enough to secure forgiveness and redemption for anyone who is dead in sin, raising them up and making them sit together in heavenly places in Christ Jesus (Ephesians 2:5-6). This abundant grace also opens the door to healing from all kinds of sicknesses, and it delivers from captivity, oppression and all kinds of demonic powers. Furthermore, it is able to breakdown the strongholds of the devil and produce transformation in lives. The saving grace of Jesus Christ is available to all human beings without exception; do not reject or ignore it, but rather accept it with thanksgiving and your life will never be the same again Amen! Thank God for the work His redeeming grace has done in your life, recounting them to Him.